What Does It Mean When Your Dog’s Nose Is Dry? A dog’s nose is a thing of wonder. With approximately 220 million scent receptors, compared to our measly 5 million, a dog can use his snout to detect subtleties in odor completely lost on his owner. The wetness of dogs’ noses plays an important role in their miraculous sense of smell, so it makes perfect sense that pet owners may be concerned if they notice their pup’s snout looking a bit, well, dried out. While a wet nose can be an indicator of a dog’s well-being, judging your pet’s health is not as simple as whether their nose is wet or dry. So what does it mean if your dog’s nose is dry? Should you be concerned? Not necessarily, explains Dr. Kate Earl, of DoveLewis Veterinary Emergency and Specialty Hospital in Portland, Oregon. Dogs lick their noses for a variety of reasons, but the main purpose of the behavior is that it helps with the olfactory process — how they smell. 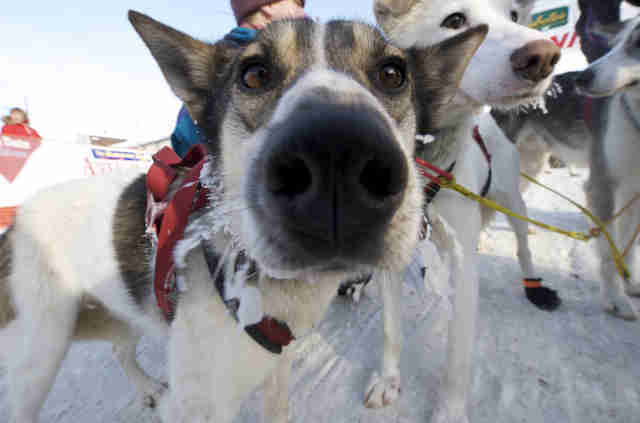 A dog’s nose secretes a layer of mucus that helps to trap tiny scent particles on the surface. According to Vetstreet, a dog will lick his nose so that these chemicals can then be analyzed by the olfactory glands on the roof of his mouth. A wet nose may help dogs pick up a scent more easily, but if their nostrils aren’t glistening, don’t worry just yet. What does a healthy dog nose look like? According to Earl, not all pet noses are created equal. An ill dog can also have a cold, wet nose, while a perfectly healthy dog can have a warm, dry nose. 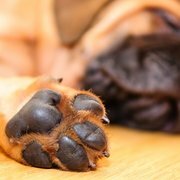 When dogs sleep, their noses tend to dry out, as they are not licking their snout quite as much. It’s best not to put too much stock in the hourly state of your pup’s snout, so pet owners can breathe easy. “Just keep an eye on it and visit a veterinarian if anything seems out of the ordinary,” she advises. When should you be concerned about a dry nose? While it’s totally normal for your dog to have a dry nose, if other symptoms accompany a dull and cracked muzzle, it’s time to call the vet. Pet owners should watch out for symptoms such as vomiting, diarrhea or lethargy, which can indicate a medical condition. “Also, if your dog’s nose feels unusually hot, either check your dog’s temperature (if you know how to do that safely) or make a trip to the vet,” Earl says. Is a dry nose uncomfortable or painful for your pet? Why Do Dog Paws Smell Like Fritos? “Some conditions might also cause nasal discharge or crusting, which can be uncomfortable,” Earl notes. If your dog is releasing more gunk than normal, the sniffles could be caused by a variety of conditions like allergies, an infection or even a tumor. It’s important that pet owners bring their pup in to be examined by a professional if they notice any change in appearance or behavior. Keep that brilliant nose in fighting form, and your pup can continue to sniff with all 220 million receptors.